Wounded Times: Australia: PTSD Navy Veteran Has Dog as Co-pilot...on motorcycle? 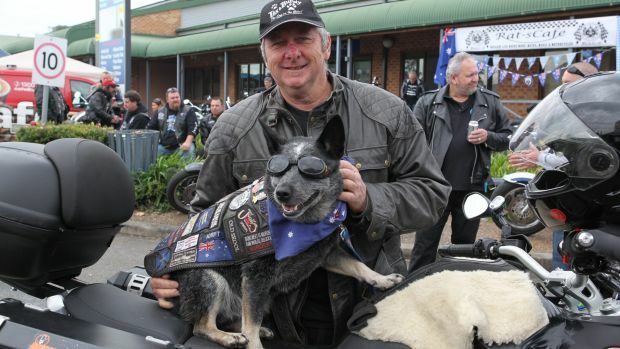 Australia: PTSD Navy Veteran Has Dog as Co-pilot...on motorcycle? Start by pushing the dog sitting on the motorbike up and down the driveway, said Tex O'Grady who owns the dog, Bundy. Then a lap of the block. Turn the engine on next time. "Eventually that block becomes a lap of Australia," Mr O'Grady said. Bundy is a registered assistance animal, who received training from non-profit Young Diggers, which trains therapy dogs and veterans suffering from PTSD. Bundy is the only dog in Australia who has permission - except in the Northern Territory and South Australia - to ride between the handlebar and the driver of a vehicle.